There are many considerations - what do you want to weave - fabric, rugs, tapestry; how big a piece do you intend to weave; how much space do you have; is this your first loom; what is your level of knowledge and interest; is the loom for you or someone else; price goes up with size and features - how much do you want to spend? These looms (Glimakra's Standard, and the Schacht Cranbrook Loom) combine the rising/sinking action of the counterbalance loom with the ability of the jack loom to open any shed, whether balanced or unbalanced. They are quiet, sturdy and the favorite of many highly skilled weavers. These smaller, less expensive, portable looms are usually jack looms. Sometimes they have springs under the shafts to hold them down. Table looms are good for learning as they are portable enough to put into a car or even on a plane to take to a workshop. These looms provide the equivalent of two-shaft weaving and can be adapted to behave as a four shaft loom by adding a second heddle set. 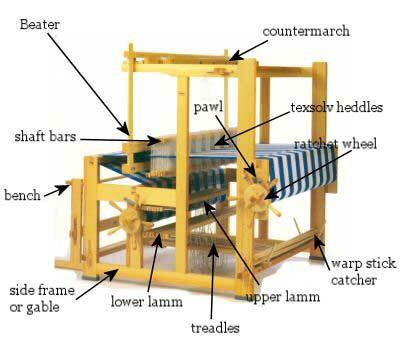 The tapestry frame loom is the most simple form for a weaving loom. The Navajo loom would be considered a frame loom. A simple loom comprising two sticks between which the warps are stretched. One bar is attached to a fixed object and the other to the weaver usually by means of a strap around the back.